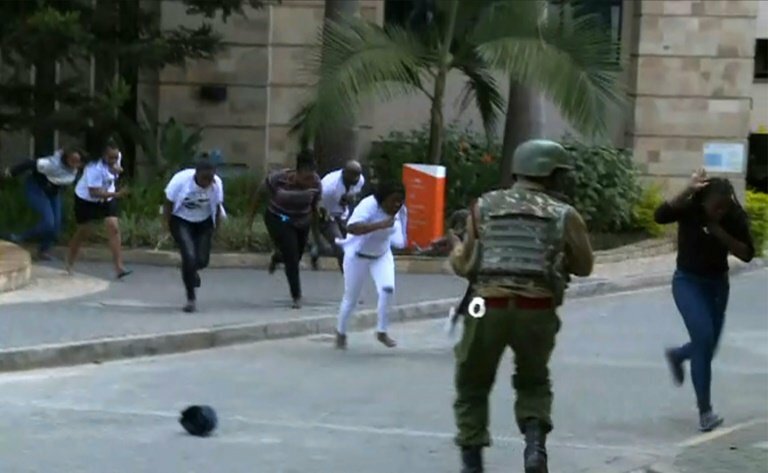 The victims of an Islamist attack on a hotel and office complex in Nairobi include a Kenyan football blogger, an American who survived 9/11 and two best friends working to bring peace to Somalia. Here is a little bit more information on some of the 21 victims. CCTV operator Dedrick Limisi, 47, was shot trying to rescue his colleagues, his father Zachariah Amusala told AFP. "My son died while trying to save lives. He had taken some people out, and when he got out with them, he realized one of their colleagues was missing, so we are told that he ran back to look for her and while running out with her, they were both shot from behind. So to me, he died as a hero," Amusala told AFP outside Chiromo mortuary on Thursday, after identifying the body. He said he got the information from Dedrick's colleagues, who described to him what happened during the attack. Football enthusiast James Oduor was due to turn 35 the day after his death. The Standard newspaper said he was among the first to call for help on Twitter. "What's happening at 14 Riverside man. We're trapped in our buildings. Gunshots and non-stop explosions." He was later reported dead, prompting an outpouring of grief on social media. The employee of LG Electronics East Africa was so passionate about football that he started Wadau TV - a Youtube football channel - where fans of the game would hold discussions. "We've known each other for a long time, football brought us together. U were like a big bro, and team mate. Your personality stood out and got well with everyone. Its been long since I cried, but I mourn you deeply. You have left a big gap in Kenya, I will forever remember you and you live in me. Shine on your way Fam, till we meet again," read one of many messages posted on a tribute website. Luke Potter was the Africa Programmes Director for the Gatsby charitable foundation, according to his company which is based in the complex. He held dual British-South African citizenship. "Luke was instrumental in establishing our forestry programme and team in Kenya, and provided crucial leadership, guidance and support to our Tanzanian forestry programme and our tea programmes in Rwanda and Tanzania," Gatsby said in a statement. On his company profile he describes himself as a lover of water-sports, camping and hiking. Jason Spindler, 40, was the co-founder of consulting and investment firm I-Dev, and was working in Kenya on a mini-power grid project tailored for remote areas, according to the company's website. "It's with a heavy heart that I have to report that my brother, Jason Spindler, passed this morning during a terror attack in Nairobi," his brother Jonathan wrote on Facebook, in comments visible only to his friends. On September 11, 2001, Spindler was working for investment bank Salomon Smith Barney in the World Trade Center. Abdalla Sheikh Dahir and Feisal Rashid Ahmed were colleagues working on a project for Adam Smith International (ASI) called the Somalia Stability Fund "to bring peace and prosperity to Somalia through more than 100 local community initiatives." The two men, described as "bosom friends" in local media, were killed while eating lunch together on the terrace of one of the restaurants in the complex.